At long last, fall is in the air. And soup just keeps sounding better and better. Sure there's your basic run of the mill soups (I'm on to you chicken noodle) but why not curl up to something different tonight? A big bowl of ramen might just be the ticket. 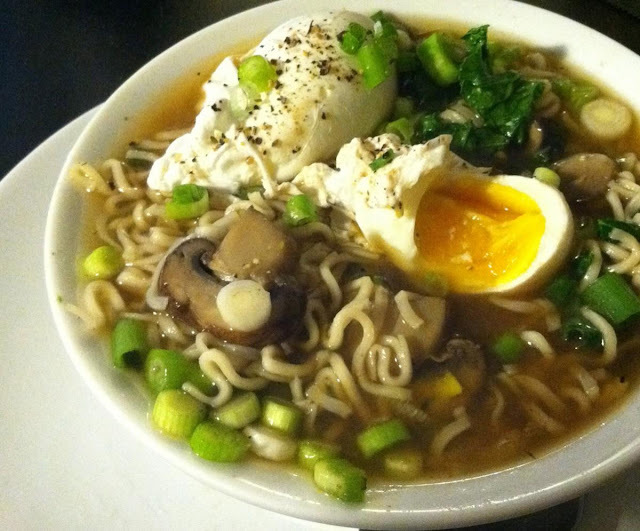 Long strands of ramen noodles, tender mushrooms and kale add appropriate structure and body. Top with scallions and poached eggs and dig into autumn spoon first. Heat a small pot over medium heat. Add the olive oil and garlic and cook for 30 seconds or until fragrant. Add the mushrooms and lightly season with salt and pepper. Cook until tender, add the stock and one teaspoon of soy sauce. Bring to a boil and add the noodles, cooking according to package directions. Turn off the heat and add the chopped kale and stir until just wilted, about 30 seconds. Taste and add an additional teaspoon of soy sauce, if necessary. In a separate pot, bring a small pot of water to a simmer. Add the white vinegar and crack the eggs into a small bowl. Using a wooden spoon, stir the water vigorously creating a whirlpool. Add the eggs one at a time and simmer for 3 minutes or until the eggs are set. Drain on paper towels and place on top of the soup.